Last week, I talked about Zimcode and ended with a promise that we would hear about Alvin Chitena’s story and how he founded the coding organization. So here is his story in his own words of how he got to doing just that. I lived out the formative years of my childhood in an apartment in downtown Bulawayo. From an early age, I developed an interest in computers. It started off with the basics like tinkering with Microsoft Office until I learnt how to properly assemble a computer from scratch. During the 2008 crisis and the years that followed, I used my skills to earn a living. At the time, I had become an incredibly fast typist. I worked on the weekends and holidays at my cousin’s shop and made a decent living off typing up people’s projects and C.Vs because not many people had personal computers. As years went by and more people started owning their own computers, I then moved on to working in the internet café in the same shop and gained a lot of network troubleshooting skills. As I grew older, my skill base grew and I ended up being a mini jack-of-all-trades in general computing. I did repairs, software installations, network troubleshooting, graphic design and so much more. I wasn’t satisfied with that though. I wanted to go a step further and become a developer, but that ambition proved all too difficult. I had no idea where to begin. Web development, Visual Basics or C? There was no one I could ask for help or at the very least, no one I could look up to as role model. At my high school, I was forced to drop ‘Computer Studies’ in Form 3 because I got into the Science class and it was reserved for the Arts class. Till this day, I wonder if the school administration sees the irony in that. But even if I had continued with Computer Studies, it would not have taught me how to code because our school used the HEXCO Computer Studies curriculum which is basically just Microsoft Office. I even thought about taking coding lessons at a night school, but the prices were too exorbitant. The ambition to learn how to code had to be delayed. 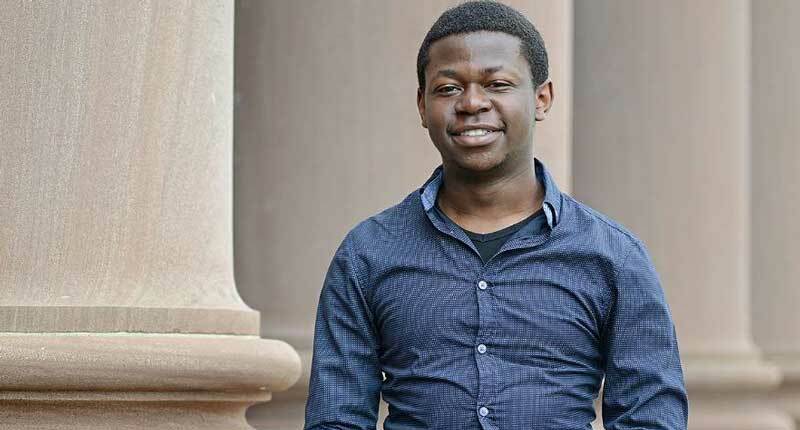 Fast forward a few years, I had been selected to join U.S.A.P (now run under Education Matters), a program which aides 30 to 40 talented students from all over Zimbabwe in applying to top colleges in the United States. I applied and was fortunate enough to earn a full scholarship to study at Wesleyan University in Connecticut. It is there that I had my first encounter with code. It was in my Introduction to Programming class during my first semester I really enjoyed that class because every time I was in a lecturer, I felt like a kid playing with a new toy. I had so many questions about Python and coding in general, most of which had to wait until I was in a more advanced class. My visiting Professor from France traditionally taught higher level Computer Science classes, so he would often spice up our lecturers by adding some advanced Python material. Fast forward to my second semester and I was well on my way to declaring a major in Computer Science. I now had all the confidence that I lacked back home when I was eager to learn but just could not bring myself to begin. Since then, I’ve taken several Computer Science classes and have collaborated with a lot of students at hackathons and on different projects. On campus, I am a member of a group called Kai Entrepreneurship Wesleyan that advocates for openness and inclusion in Tech and Entrepreneurship. I am also on the Advisory Board of the university’s Social Entrepreneurship Center where I contribute to building the entrepreneurial spirit on campus. My passion also extends to my campus job. I am a student manager of campus I.T services for classroom technology and students. All these engagements help me grow as a tech entrepreneur and expose me to different people who can offer advice and support for the work that I do. As I was thinking about my upcoming summer break in Zimbabwe, I took time to reflect on the tremendous privilege I had to learn code from such good professors at a great institution. I was a little bothered though by the fact that a lot of my peers had some exposure/access to code prior to coming to college whereas I did not. This gulf in knowledge was evident in the way we learnt programming. My peers were either more knowledgeable or more confident than I was because they had so much exposure to coding through multiple avenues. I asked myself a seemingly simple question, “If I love code so much, why did I have to wait 19 years of my life and a trip across the Atlantic to finally learn it?” The answer is obvious. Back in Zimbabwe, I did not have significant or consistent access to code. This is why, in the second half of my first year at Wesleyan (January 2016), I founded ZimCode. I’m currently working on a software engineering career with the end goal of ending up in the Tech Education department of big tech companies like Google Education and Internet.org (Facebook) because I thoroughly enjoy the intersection of technology and education. Some advice for young Zimbabweans: if the dream seems too big to achieve, look for stepping stones that will take you there one step at a time. Spend your time and energy (especially on social media) reading up about people/organizations that have achieved what you hope to achieve and surrounding yourself with people who share your passions and are very ambitious.